Based on Edgar Rice Burroughs’ (Tarzan) adventure stories, John Carter is a film full of visual delights. More of a Western than a futuristic sci-fi movie, the exotic characters and glorious 3-D make for an exciting escapade. Title character John Carter, played by muscle-bulging hottie Taylor Kitsch, is from Earth. In fact, he fought in the Civil War and is haunted by the loss of his wife and child. After striking it rich in an Arizona gold mine, he is transported to Mars, known to the local residents as Barsoom. But this isn’t the Mars from which NASA’s rover Opportunity sent us all those amazing photos. Barsoom is more like the old Wild West where lawlessness and violence prevail amongst its otherworldly inhabitants. Soon John Carter, known gleefully as “Virginia” to the race of Tharks (who confuse his name with his home state), is admired for his ability to jump long distances, due to Barsoom’s lower gravitational pull. The story really gets going however, when he meets Princess Dejah Thoris, played by beguiling beauty Lynn Collins. Dejah, part Princess Leia and part Lara Croft, has a scientific mind and amazing body, with both muscles and curves, making Angelina Jolie‘s scrawny leg at the recent Oscars seem quite undesirable. Oh, and did I mention Collins is a phenomenal actress? A Texas native who was Shakespearean-trained at Juilliard, Collins is sure to be appearing at more theaters near you. As John Carter joins forces with Princess Dejah, they fight to save her beloved city of Helium from a rival ruler Sab Than, played by Dominic West, who plans to wed Dejah against her will. This is a story we’ve seen before and with all the action and steampunk-inspired spacecrafts, there’s little time to develop characters beyond the basics. One actor who did a terrific job making his small part of Kantos Kan noteworthy, is fetching Brit actor James Purefoy. 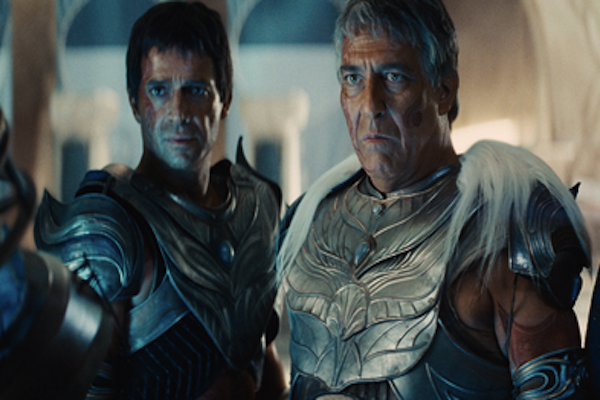 Teaming up with previous actor-in-crime Ciarán Hinds as Thark King, Tardos Mors, these two make Barsoom’s gravitational pull a little stronger. Bottom line: John Carter in 3-D is a visual delight with lots of good acting and bizarre creatures to keep you entertained with the kids on a Saturday afternoon.